HIGH SPEED PRODUCTION : 1000pcs/min. CE, UL model is available. Option : autoloader, hopper dryer, hydraulic screen changer. Longer water tank, double vacuum devices, combined with double sides support assures excellent cutting quality. The gears are precision ground and hardened to ensure smooth and quiet operation. The high precision bearings provide and extremely smooth and long lasting running performance. The screw, manufactured from Aluminum Chromolybdenum alloy steel (SACMI), is stress relieved, precision ground and nitride treated for a long service life. The barrel, manufactured from Aluminum Chromolybdenum alloy steel (SACMI), is stress relieved precision ground and nitride treated for a long service life. The stainless steel (SUS410) due undergoes nitride hardening treatment for a long service life. The water tank is constructed of stainless steel, #304. The water storage tank is power adjusted transversely and manually adjusted vertically to ensure convenient take-up and die-change. The easy to change, two-die system provides a straw diameter range from 3.8mm to 8mm with easy adjustment of thickness. High production rates for JS 284. 800-120 pcs/min for 120mm sharp end straws. 300-500 pcs/min for 210mm straight straws. Variable straw length, 100mm~300mm, can be easily adjusted when the machine is runing. The belt type take-up unit ensures an even stabilizing speed and prevents straw slippage during take-up operations. The toothed belt transmission incorporated with a DC motor ensures great stability for precision cutting and straw length accuracy. 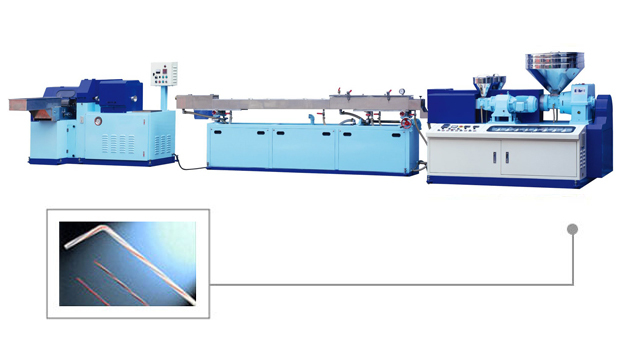 The cutting unit can produce both sharp end and straight straws. Rotation angle of convey or belt type take off unit is adjustable for convenient operation. Double sides support assures excellent cutting quality. ensures the perfect concentricity of the straws. * All specifications and design characteristics are subject to change without prior notice. JUMBO STEEL MACHINERY CO., LTD.